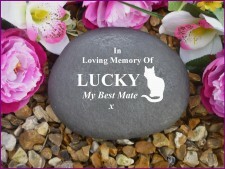 We aim to make ordering your personalised memorial as easy as possible. Add a note in the text box when placing your order on line. We will email you a draft of your engraving to check and approve. Once you confirm that you are happy for us to proceed, your order will be processed and despatched in due course. Please note, we will not proceed with your order until we know that your are completely happy with your engraving. If you would like to see a draft preview before you buy, so that you can visualise how your memorial will look, then just let us know. We are a specialist memorial gift service offering a unique range of personalised memorials that are a wonderful way to remember your loved one.